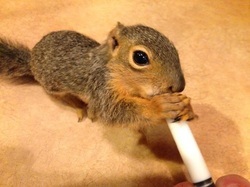 Want to help wildlife rescue? We have bills for the vets if an injured animal comes in. We don't go to extreme measures and sometimes we have to euthanize for the good of the poor creature. This also comes out of our own pocket. Same for medications, first aid supplies, cages and building materials, puppy & kitten formula as well as dog chow for the orphan coonies. There are no grants or DNR Funding to support us, we do this for the love of animals and a wish to put back what has been taken from nature. and the cost of 8 foot fencing. Then if these animals need vet care (like the baby fox kit hit by a car) I take to the vet and treat - normal costs - I'm just lucky to have veterinarians that love wildlife too. If an animal is too injured to save, yes I have to pay for euthanasia just like a pet then take home to bury. puppy chow is wonderful! Thanks again! Building materials of any sort - we always have need for anything to help us build, Hardware cloth, lumber, screws we are growing! If you'd like to make a donation today feel free to use www.PayPal.com my email is 2ndHRR@Gmail.com - if its in honor of a lost critter make note of it and I'll be sure to list your name and critter on my Thank You page. If you'd rather not that's fine too. Any amount helps us fund this project and is so appreciated, together we can make a difference.